I am starting to feel cursed that I am unable to brew an Irish Red Ale, a style that I really enjoy drinking. My first attempt brewed fine but didn't taste like I thought it should (and it wasn't my recipe). The second attempt had a volume and gravity issue that watered it down. It was drinkable but hardly memorable. The third attempt stalled during fermentation at too high a gravity. I tried to fix that with glucoamylase and ended up with a "Brut Irish Red Ale" that was drinkable but not what I wanted, either. This time I am hoping to nail it. I'm creating my own recipe this time around, loosely based on those I've seen online. I'm using Maris Otter for an authentic base, layering on some Caramel 40L for a caramel flavor, 120L for some color and dark fruit, roasted barley for more color and a touch of flavor, and Melanoidin malt for body, red coloring, and foam stability. I'm using a single dose of East Kent Goldings for authentic bittering, Brewtan B for shelf stability, and Irish Moss to help brighten it (with gelatin in secondary if needed). As usual, I'm including Clarity Ferm to reduce gluten so that my gluten-intolerant friends are able to enjoy the beer as well (so far they've found it drinkable and enjoyable). These characteristics place it at the upper end for gravity, toward the lower end for bitterness, toward the upper end for color (I'm aiming for a nice red color), and toward the upper end for alcohol content. 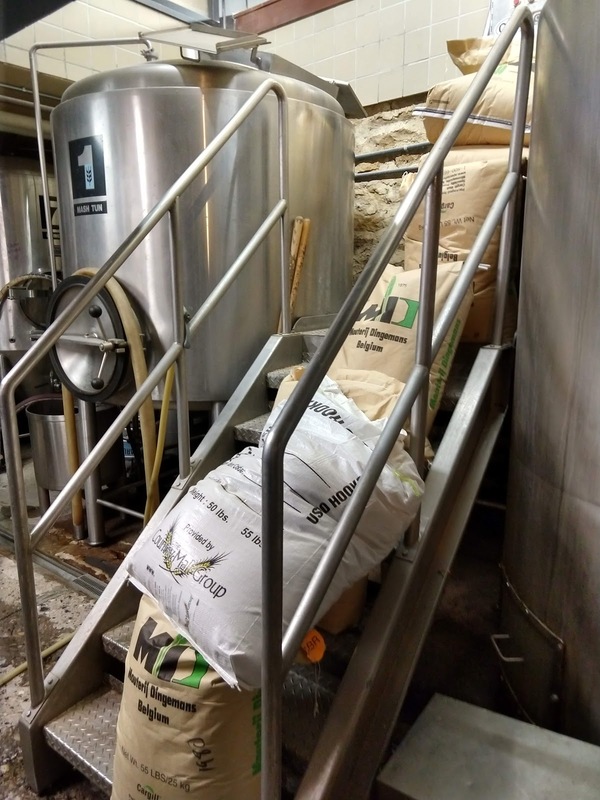 The point of the complex mash it to help bring out some malt complexity in the finished beer. Competition judges have criticized some of my recent British styles for a lack of malt complexity, so I am hoping to dial that up here and see how it goes. Wort will then be moved to a sanitized and cleaned fermenter with temperature control. The yeast's optimum range is between 62F and 72F. I plan to aim for a temperature of 67F and hold it there through fermentation, perhaps raising it to 72F toward the end, to help the yeast clean up and reach final gravity. The yeast nutrient is there to help it. I'll be pitching the entire package to ensure a healthy yeast population, since I don't plan to brew any more Irish styles for a while. If the beer seems hazy, I may drop in gelatin finings to clear it up before bottling. 04/25/2019: Ingredients were gathered and loaded into the Brewie+. 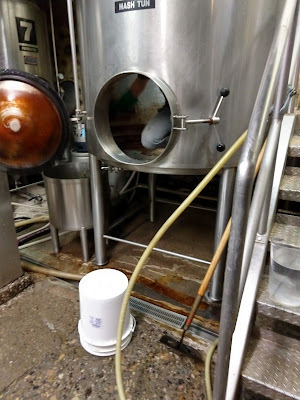 I programmed it with the mash and boil schedules and waited near it while it loaded the mash water, returning a bit later when it loaded sparge water. I adjusted the volumes to ensure that they were on track, but ended up adding some to the mash to cover all the grain. After brewing, gravity registered 1.045 SG on the Tilt Hydrometer and the temperature read 75F. I pitched the yeast and set the temperature control to 67F. I ended up with over 2.75 gallons of wort, something along the lines of 2.8 gallons. Azacca hops: Citrus and mango notes with a little orchard fruit. Belma hops: Clean with a very orange, slight grapefruit, tropical pineapple, strawberry, and melon aroma. Hornindal Kveik yeast: Complements fruit-forward hops with its aromas of fresh pineapple, mango, and tangerine. Fermenting at high temperatures (up to 95F) will intensify the aromas and speed up fermentation. Blend all that and we should get lots of nice citrus, mango, pineapple, and grapfruit aromas and flavors. I plan to intensify that by using only later-addition hops and whirlpooling with a bit of the hops after flameout. Place fermenter in an insulated bag with a heating element, set temperature to 80F. 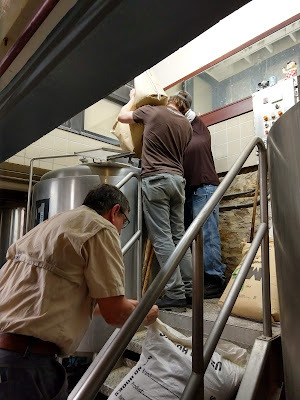 Seal the bag and allow the yeast to maintain a temp of at least 80F through fermentation, raising to 95F after 65-70% attenuated and add dry hops of Azacca and Belma for 3-4 days. I plan to bottle with a single Coopers carbonation drop per 12-ounce bottle. I don't plan to cold-crash or add finings. 04/13/2019: At the last minute, I decided to add the Carapils to the recipe to ensure some body and a nice head on the beer. I also decided to toss in a couple of ounces of flaked corn I had lying around that needed to be used. Pre-boil gravity registered at 1.051 SG on a refractometer. Post-boil, after the built-in chiller had dropped the temp to 176F, I paused the process. I dropped in a muslin bag with the Azacca and Belma whirlpool charge and began stirring the wort around for the next ten minutes. After that, I resumed the chilling process and got to work sanitizing a fermenter. By the time I'd finished with the fermenter, the wort was down to a yeast-safe temp. I pumped it into the fermenter and was pleased to see it registered 2.5 gallons (my target volume). When I dropped in a Tilt Hydrometer (and tested a couple of drops on the refractometer), but measurements yielded the same 1.053 SG. I pitched the entire yeast package and Clarity Ferm. 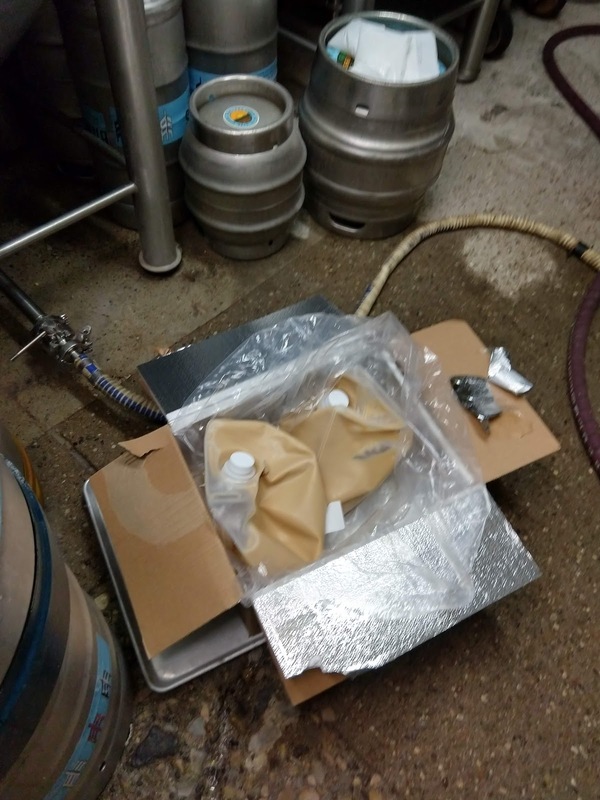 I then moved the beer into one of my large Igloo coolers, added a heat wrap, and configured temperature control to keep the inside of the chamber to 85F (at least initially) and see about getting the beer up closer to the top of the yeast's range. This will maximize the yeast's aroma and flavor contributions - and speed up fermentation. 04/14/2019: It's roughly 12 hours since I pitched the yeast. Temperature in the fermenter is now up to 74F and the gravity has dropped from 1.053 SG down to 1.048 SG, which implies the yeast is alive and well in its new environment. 04/16/2019: The Tilt Pi stopped communicating with the Tilt Hydrometers yesterday. After the SD card was reimaged and reconfigured, it worked again. Today the gravity of the beer is reported as 1.027 SG and the temperature as 83F. 04/19/2019: The gravity is down to 1.014 SG. The temperature is up to 86F, owing to an increase in the temperature of the fermentation chamber. 04/21/2019: The gravity is down to 1.013 SG. Temperature is holding at 86F but I plan to increase the temp in the fermentation chamber later today to try to get it up in the 90F-98F range. At this point we're only about 4 points away from the expected final gravity. 04/24/2019: The gravity is down to 1.009 SG today. The temperature is up to 98F. It seems that the increase above 90F really helped this yeast get going. I need to remember that for next time if I decide to brew this again. It wants to ferment very warm and may need a starter. MadTree PsycHOPathy is an American IPA brewed in Cincinnati by MadTree Brewing. They post the recipes for all of their beers on their web site. These recipes list the ingredients and most of the vial information for the beer, but omit some of the details you might need to precisely replicate their beer. However, if you ask nicely, I've found that they will fill in the blanks. For example, they told me the mash temperature they use is 149.5 degrees Fahrenheit. I'll use 149F myself, knowing that the temp in the Brewie+ varies a little during mashing, so it will hover around 149.5. I took MadTree's published recipe and reproduced the grain bill for the Brewie+ and ran that through my mill. I then took the alpha acid values for all the hops and reworked the amounts so that I am getting approximately the same number of IBUs from all my hop additions that MadTree gets from theirs (according to the published recipe). This should mimic their hop flavor profile as best I can reproduce it. The resulting recipe and process appears below. Ferment at 60-66F for 7-10 days or until gravity is approximately 1.020 SG. Add Dry Hops and leave until FG is reached or 3-4 days, whichever is longer. Add gelatin finings and cold crash until clear. 04/08/2019: The water loads were a little high and had to be adjusted slightly. However, I did notice that the mash water level was too low to cover all the grain so I ended up adding back about 48 ounces. Sparge water also loaded high, so I adjusted it down by about a liter or so. Gravity read 17.1 Brix (1.072 SG) late in the mash before the sparge water was added. Adding water to dilute it a bit to get the gravity closer to the estimate of 1.052 SG pre-boil gravity. This raised the volume to 13.2 liters and dropped the gravity to 12.75 Brix or approximately 1.053 SG. Post-Brew approximately 2.9 gallons ended up in the fermenter at 60F and a gravity of 1.057 SG per the Tilt Hydrometer. US-05 yeast was pitched along with Clarity Ferm. 04/09/2019: The beer has warmed from 60F to 62F since the yeast was pitched last night. The cooler temperature must have kept the US-05 sleepy, as it showed no sign of fermentation for about 20 hours, when the gravity of the wort began to drop. Gravity has only dropped a point or two in 24 hours, but I expect that will start to pick up. 04/10/2019: The beer has warmed up to 64F and the gravity has dropped to 1.040 SG. That is 29.31% attenuation and approximately 2.2% ABV. 04/12/2019: Gravity is down as low as 1.017 SG (though it's varied as high as 1.024 SG) and the temperature has gone as high as 65F (but currently 63F). Tonight I dry-hopped it. If past experience is any indicator, this will spur some additional fermentation and bring the gravity down further, perhaps lower than the estimated 1.014 SG. 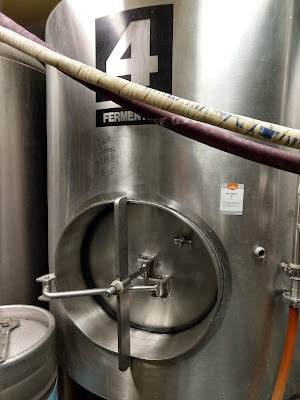 04/14/2019: Since dry-hopping, the beer has reached its estimated FG and seems (for the last several hours at least) to pretty much be holding there. I'll need to bottle it in the next 2-5 days to avoid any grassy notes from the dry hops. For now, I'm waiting to make sure it really has reached FG since dry hops can spur additional fermentation activity, which can lead to burst and overflowing bottles if you bottle the beer too soon. 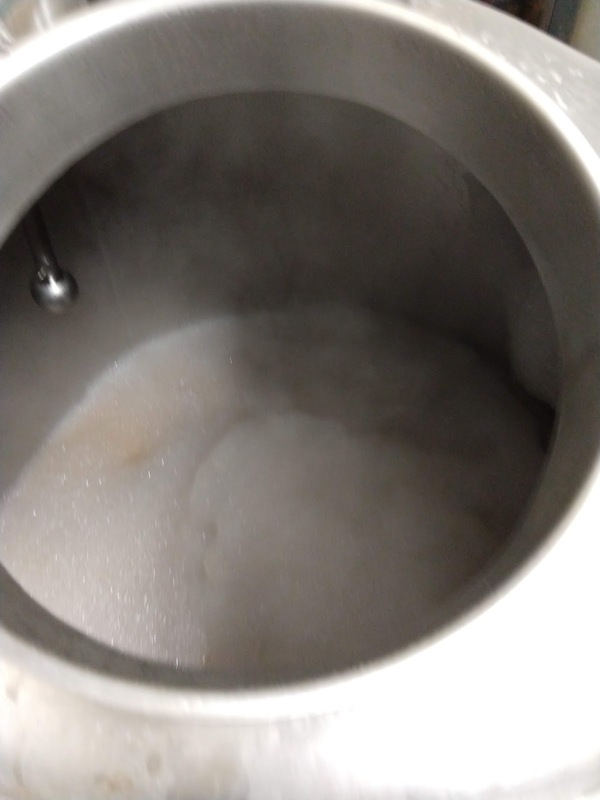 04/16/2019: The beer has been holding in the 1.014-1.015 SG range and should be ready to bottle. 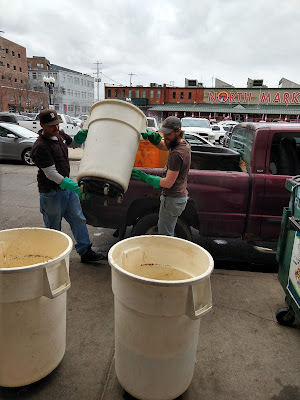 04/18/2019: The beer was bottled with a single Coopers carbonation drop per bottle. Having managed to get three successive batches out of the Brewie+ which hit my volume and gravity goals, today I decided to brew a Dry Irish Stout for possible competition. I like the style and I have never brewed it before, so it seemed like a good time to try. I began by reviewing some articles online about brewing the style, then by considering the BJCP criteria for it. I took one of the published recipes and tweaked it to suit my taste (hopefully). I added Melanoidin malt and Carapils to try to get the beer to have a nice head on it. I used Willamette hops and Bramling Cross for a little twist to the style, while not taking it too far off base. The Bramling Cross hops are used in British stouts and reportedly carries fruity, citrusy notes with some blackcurrant, loganberry, gooseberry, and lemon - sometimes even with vanilla. That should all do nicely in the stout. I'm adding gypsum to help punch up the hops, since I'm hopping it toward the lower end of the style (the style's range is 25-45 IBUs, and I'm aiming for 30). The Brewie+ was instructed to chill the wort to 62F after the boil was over. 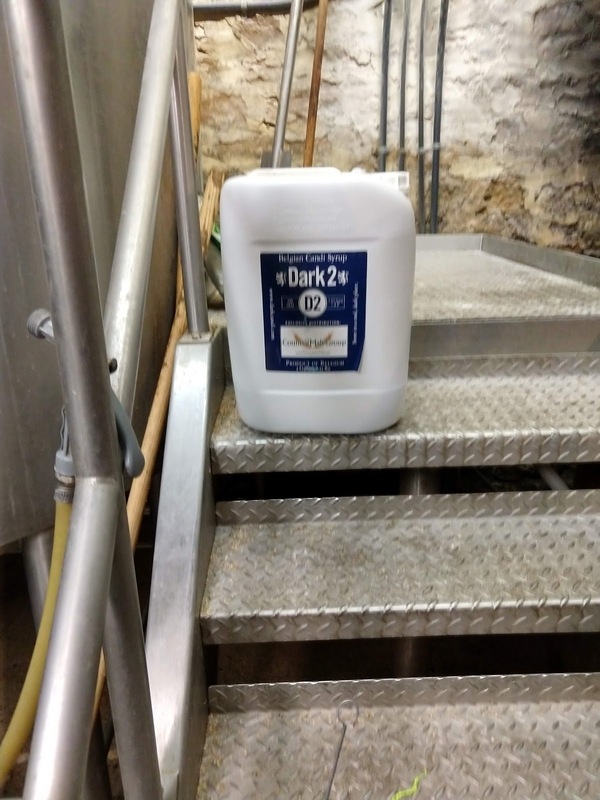 Following the end of primary fermentation, bottle direct from the primary fermenter and use either 1 large carbonation drop or 5 small tablets per 12-ounce bottle. 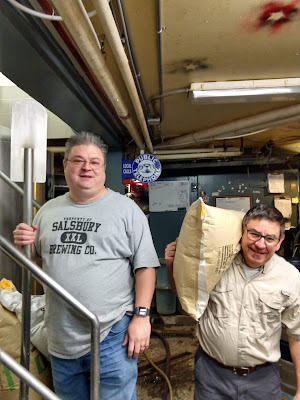 03/24/2019: I apparently ordered two extra pounds of Maris Otter malt when I ordered grain for this recipe. My original plan was 2.64 gallons of wort at a gravity of 1.042 SG. When I opened the bag from the homebrew shop, I noticed the extra Maris Otter in it (and it was mixed with all the other grains, so extracting it wasn't really an option). To correct that, I scaled the recipe up to 3.5 gallons. Fortunately, I had enough extra specialty malt on hand to reach that volume. The 4.8% ABV is a little above the BJCP criteria for the style but I'm hoping it will be close enough that no one knocks my score down for it in competition. The Brewie appeared to load the correct amount of water for the mash process, and required no adjustment by me. For the sparge, it loaded about 3 liters more than I wanted, so I removed that excess water before adding the gypsum to it. I held onto the extra water, however, as I wanted to use it if the pre-boil volume was too low later on or the gravity too high. The mash appeared to go well, with the wort achieving a nice deep brown color pretty early on. During the mash, before the sparge started, a refractometer reading was 19.0 Brix. That represents standard gravity of approximately 1.081. Assuming the sparge water dilutes that quite a bit, we would still appear to be on track for a 1.048 SG original gravity. After the sparge, the wort level was much lower than expected. I ended up adding back the water I removed during the mash/sparge process and a little extra to hit the expected depth of 18.0 cm in the kettle pre-boil. The refractometer registered 11.1 Brix pre-boil at an estimated 15.8 liters (4.17 gallons) in the kettle. That works out to a gravity of approximately 1.046 SG. One of the tilt hydrometers registered the gravity 1.033 SG pre-boil. I figure reality is somewhere between those two figures, perhaps around 1.0395 or 1.040 - which is where my calculations had estimated it would be. In the fermenter, the gravity read around 1.052 SG. After adding the yeast slurry and some distilled water, I got that to 1.048 with a volume just a hair under the 4-gallon mark in the fermenter. The temperature of the wort at that point registered 59F. 03/25/2019: Roughly 14 hours after the yeast was pitched, we're seeing fermentation activity. Gravity is registering 1.043 SG this morning, down from 1.052 SG last night. The temperature is reading 61F, up from 59F when the yeast was pitched but well below the yeast's optimum range. 03/26/2019: Gravity is down to 1.022 SG and the temperature is up to 66F. This represents 51% attenuation and 3.15% ABV. We're about 10 points away from the estimated final gravity of 1.012. 03/28/2019: Gravity is now 1.015 SG and the temperature is down to 61F. This represents 68% attenuation and 4.2% ABV. 04/02/2019: Gravity has held at 1.015 SG for a few days now, so it should be ready to bottle. 04/07/2019: The beer was bottled today, with four small carbonation tablets per bottle (medium carbonation). A flat, warm sample from the end of the bottling process had a nice chocolatey and roasty flavor to it. I'm looking forward to the finished beer. With some satisfaction that the issue with the Brewie+ overshooting target volumes being possibly solved (by removing excess water after loading), I decided to try one more recipe to see if I could consistently hit my volume and gravity targets. I decided to try another Pale Ale with a blend of Simcoe, Cascade, Citra, and Amarillo hops. 1/2 tsp. Irish Moss at 15 min. Keep fermenter in an area of the basement with an ambient temp of 60-62F, which should keep the beer in the same temperature range throughout fermentation. When FG is reached, prime and bottle. 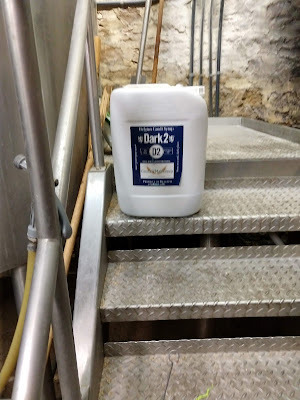 03/10/2019: The final volume was right at the 2.5 gallon mark in the fermenter. The yeast took off about 12 hours after pitching. The ambient basement temperature held the beer at 60-62F throughout fermentation so it was a nice clean ferment. Final gravity reached 1.019 SG. 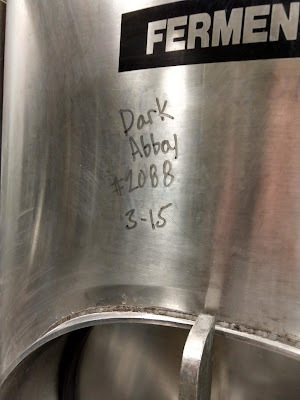 03/19/2019: The beer was bottled today, using carbonation tablets to a "high" level of carbonation (since recently I've noticed many of the beers seemed pretty flat). 03/24/2019: I took a bottle of the beer and placed it in the fridge to test carbonation and flavor. It's a little early but I wanted to know if we were getting carbonation or not. My last two attempts at an Irish Red Ale were (at least to me) disappointing. The first did not taste all like an Irish Red to me, though it was a very drinkable beer. The second ended up way over volume and therefore came out kind of bland. This time around, I'm babysitting the Brewie+ to make sure I get the results I am looking for. This recipe began as one of Gordon Strong's, but I've modified it slightly to see if I can get a nice head with long retention and a little more reddish color. Bottling will take place after the above. Bottles will be held in an environment at the upper end of the WLP004 yeast's temperature range. 03/17/2019: I "lied" to the Brewie+ and told it we were loading only 2 pounds of grain into the system, so that it would allow me to specify smaller amounts of water than it likes to permit. 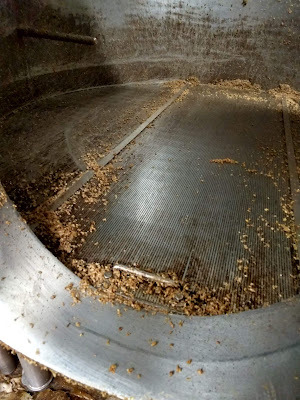 Despite this, the Brewie did load more mash and sparge water than I specified. I dipped out and discarded this extra water to ensure a successful result and proper original gravity. A pH reading during the early stage of the mash reported 5.3 to 5.4. During the boil, my wife told me that she thought she smelled chocolate chip cookies baking, which gives you some idea of how nice the aroma was. I had to adjust the water level during the mash to get it where I wanted it, removing some from both the mash and sparge amounts, but they were closer this time than they've been. Then again, the amount at the boil was a little low, too, so I ended up adding most of a 90-ounce water addition pre-boil. Original gravity registered 1.057 SG on the Tilt Hydrometer in the fermenter, at a temperature of 68F. I did not pitch yeast immediately because I decided to grow my package of WLP004 Irish Ale Yeast to the point that I can split it off and do a Dry Irish Stout next weekend with the rest. I'll pitch the yeast tomorrow night. I'll save half the yeast for the stout, which should get into the fermenter next weekend (hopefully). 03/18/2019: The yeast starter exceeded my expectations by overflowing the 1L flask despite being constantly stirred with a stir plate. I saved half for the Dry Irish Stout I am planning to brew next. 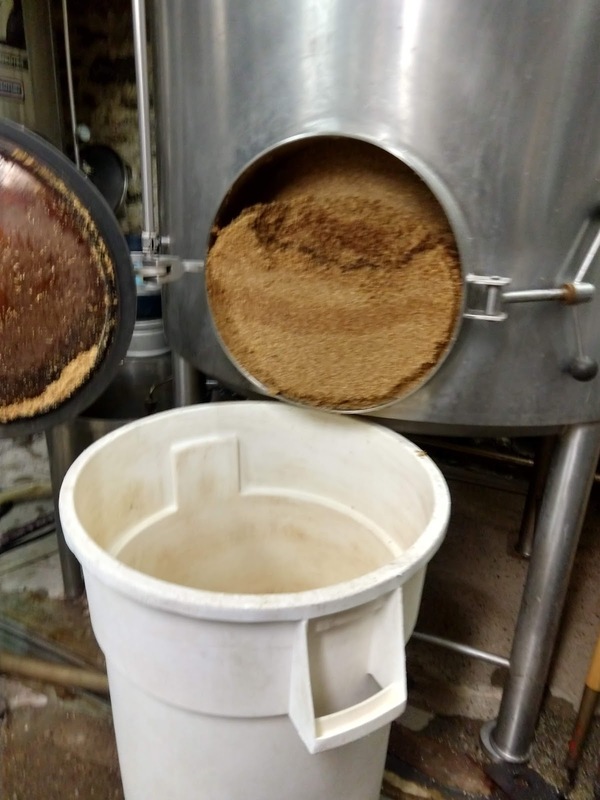 At the time of yeast pitch at approximately 10pm, gravity registered 1.056 SG and temperature read 61F. 03/21/2019: The gravity is now 1.032 SG, and the temperature is 63F. This is about 46% attenuation, so the yeast has a way to go yet. 03/24/2019: I added some glucoamylase enzyme to try to encourage further fermentation, as the gravity is registering 1.023 SG - outside the style's recommended range of 1.010 SG to 1.014 SG. 03/26/2019: Gravity is registering 1.018 SG today, temperature 62F. That's 68.4% attenuation and 5.12% ABV. 03/28/2019: Gravity has dropped to 1.007 SG today, temperature 61F. That's 88.7% attenuation and 7.2% ABV. The enzyme has taken the beer far past what I expected, and gravity still seems to be dropping. 04/03/2019: Gravity has dropped all the way to 0.999 SG. That represents 7.61% ABV and a hypothetical 101.75% attenuation. I didn't expect the beer to taste so great, having been fermented down that low, but a sample pulled from the fermenter was quite drinkable - but a bit too light in color and perhaps a bit too thin in body to be a true Irish Red Ale now. I'm considering entering it into competition as an experimental "Brut Irish Red Ale". 04/07/2019: The gravity has held at (essentially) 1.000 SG for several days. I bottled it today with four small carbonation tablets per bottle (medium carbonation). Recently, I have struggled to get the desired final volume out of the Brewie+ system. To try and resolve that issue, I've decided to brew a couple of recipes and babysit the mash and sparge process to see where the problem is occurring, as well as double-checking my calculations to ensure they are correct. The first test was this Pale Ale recipe. 0.75 ounces of Mandarina Bavaria hops pellets @ 9.2% AA at 10 min. 1/4 tsp. Brewtan B in the boil at 10 min. 1/2 tsp. Irish Moss in the boil at 15 min. The mash schedule began with a mash in at 104F, followed by 20 minutes at 140F, and 40 minutes at 158F. Mash out was 15 minutes at 168F. 03/09/2019: Thanks to carefully measured water, the beer came out very close in gravity and volume to the expected values. I had to add a little water to hit 2.5 gallons, at which point the gravity also hit my target value of 1.054 SG. 03/17/2019: The beer has stayed within a degree of 61F throughout fermentation. Gravity is down to 1.013 SG, which is within a point of the expected final gravity. I expect to bottle the beer within the next day or two. 03/19/2019: The beer was bottled with 5-6 small carbonation tablets per bottle. Yield was 24 bottles.